Serbian PM Aleksandar Vucic. Wikimedia. Public domain. Accession to the European Union is sometimes described as a courtship. Serbia’s courtship with the EU has been quick to focus on economic reforms and foreign relations. But to show that its heart is fully committed to join Europe, EU officials should require more than just commitments and low-level prosecutions to resolve Milosevic-era war crimes. High-level suspects like Goran “Guri” Radosaljevic must be prosecuted, not protected. Serbia’s poor record in confronting Milosevic-era war crimes should have always made EU accession an uphill climb for even a willing reformer. Respect for human rights is, after all, a cornerstone of the EU’s accession criteria. However, acquiescence to an increasingly toxic domestic political and media climate should have EU officials questioning Prime Minister Aleksandar Vucic’s government’s commitment to mending the past. The recent return of ICTY indictee Vojislav Seselj and his ultranationalist brand of incendiary politics is illustrative. Prime Minister Vucic, President Tomislav Nikolic, and other members of the ruling SNS party were previously protégées of Mr. Seselj in the Serbian Radical Party. Although Vucic and Nikolic publicly profess to an EU-focused agenda, many within the SNS likely retain sympathies for Seselj’s worldview and its antipathy towards Serbian responsibility for mass-crimes during the 1990’s. Prime Minister Vucic and his government have done little to distance themselves from Mr. Seselj’s divisive hate speech, which still calls for a “Greater Serbia”. An “ethnically-biased” media also portends problems. Mainstream-media in Serbia often ignores trials of Serbian suspects and emphasizes cases of Serbian victims. This is an especially troublesome sign due to the state’s “soft censorship” of the media and Mr. Vucic penchant of personally interfering and going to war with media outlets. The result is a public unlikely to understand the scope of tragedy and suffering that remains among victims and their families. Without a public outcry, little progress towards accountability will be made absent the intervention of EU officials. “Alarming” is perhaps too gentle a word to describe PM Vucic and President Nikolic’s very recent reaction to a report implicating the current Army Chief of Staff for war crimes in Kosovo. Upon releasing their documented claims, the Humanitarian Law Center was accused of trying to “bring down” the army and country. Their motivation? Opposition to the army’s heroic efforts in flood relief. The discouraging climate has had effect. After recently showing signs that his office would start going after higher-level suspects, War Crimes Prosecutor Vladimir Vukcevic and his deputy were accused of espionage by MP’s from Mr. Vucic’s ruling party. Mr. Vucic’s government has thus far failed to denounce these wild accusations. At the same time, an amendment to a mandatory retirement-age law was passed that effectively will retire Mr. Vukcevic. There are legitimate debates whether Mr. Vukcevic did all that he could during his ten-years in office. However, if we are to believe Mr. Vukcevic, this de-facto sacking was not premised on him not doing enough. It was premised on him doing too much – recently pursuing sensitive cases against the politically untouchable. This is 100% believable. For years, observers like the Humanitarian Law Center, Human Rights Watch, Amnesty International, and the European Commission have all concluded that commanders and high-ranking officials complicit in war crimes have been unofficially immune from prosecution. Take for example Goran “Guri” Radosaljevic. Radosaljevic is suspected of having responsibility in the execution-murders of three US citizens, was in operational command of the Racak massacre that precipitated NATO’s bombing campaign, and in charge of units implicated in the Cuska massacre and other notable actions against predominantly Albanian villages. Serbian prosecutors and judges have detailed how protection, intimidation, and tampering by security personnel have derailed their efforts against Radosaljevic and other suspected war criminals. Again, Mr. Vucic’s government has acquiesced to this state of affairs. Radosaljevic is effectively protected, still enjoying a seat on the Executive Board of Mr. Vucic’s political party. Coincidence or not, it is also a fact that the attacks against Mr. Vukcevic and his office began after more publically taking on Radosaljevic. Serbia is pushing to open the first chapters of its accession talks, which relate to war crimes accountability, in the next few months. Local stakeholders fear that reconciliation and accountability for war crimes have been relegated a subordinate status within Serbia’s accession process. The absence of prosecutions against senior-level officials for war crimes should hold up Serbia’s EU accession. Croatian officials have hinted that it may take such a stance. It is easy to dismiss these protestations as coming from an old Balkans rival. They should not be. 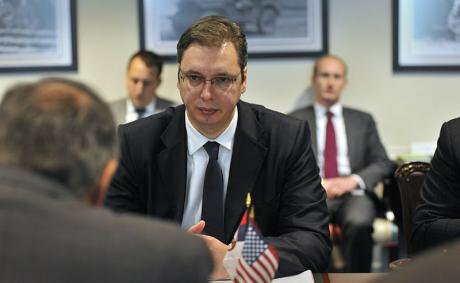 Mr. Vucic’s government has been long on promises and short on prosecutions. Once Serbia joins the EU, EU levers of influence will expire. EU officials must require high-level prosecutions now or forever hold their peace.